Emoji are extremely popular picture characters and emoticons that are an integral part of Japanese tech culture and communication, and now that they are included in modern versions of OS X, the Emoji character set is available to everyone on a Mac regardless of your localization settings. Emoji are quickly taking the world by storm with their inclusion on the iPhone and iPad keyboards as well, and using them on the Mac is a fun way to emphasize dialog and messaging between people. Some of the characters are pretty funny so even if you have no intention on using them they’re fun to browse through. 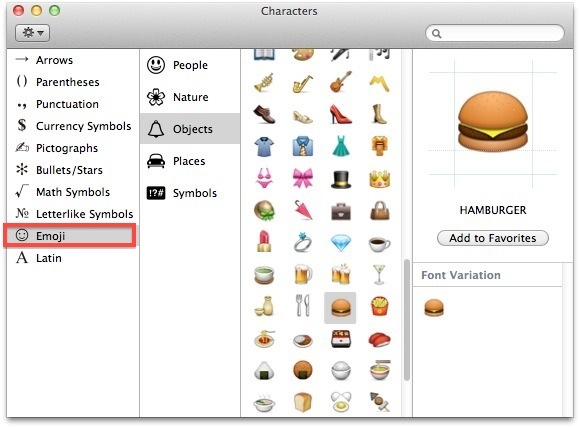 Most apps support Emoji characters at this point, though you may notice some third-party applications will not recognize Emoji characters though this is increasingly rare in OS X. 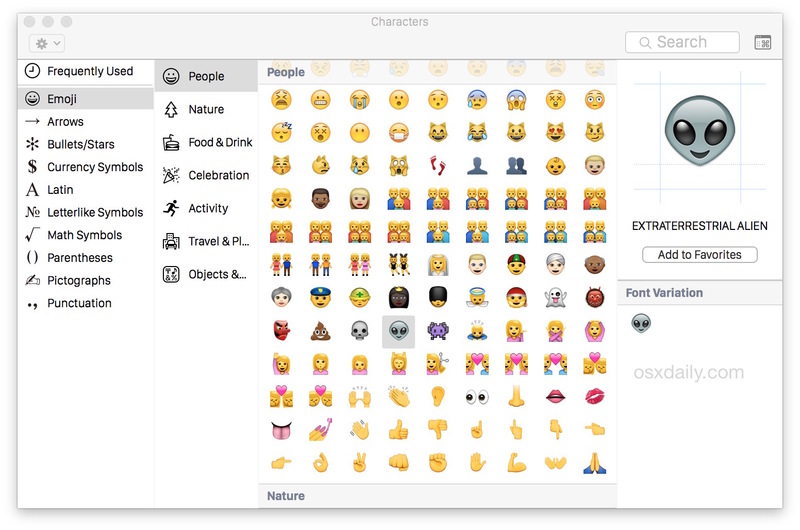 The Emoji character panel may look slightly different in the variety of versions of OS X, but they all have the same basic character support of several hundred emoji. Newer versions of OS X (and iOS) have added even more Emoji icons, with skin tone variations and much more, bringing the total number into many hundreds of emoji options. Most have Unicode support too, which is great for cross-platform compatibility. If the app doesn’t support Emoji display, nothing will be shown, and similarly if an emoji icon is sent to a user who doesn’t have a Mac or iOS device that supports emoji, nothing will be shown for them either, at best it will be a boring old square box instead of the color icon. Keep that in mind if you’re sending messages or posting the emoticons to the web, since a lot of other people using older Macs and Windows machines won’t be able to see them the same way as you do. There are hundreds of Emoji characters available in the character selector screen, they’re visible in both iOS and OS X too. Outside of the Mac and onto the mobile side of things, you can enable the iPhone Emoji keyboard (or iPad too) as long as the version of iOS is somewhat new, more modern versions of more emoji icons available, but as long as it’s from iOS 5 onward, it’ll be there for everyone too, meaning any iPhone, iPad, or iPod touch will be able to see and send the icons the same. Have fun with the Emoji icons, they’re a lot of fun. Shows up for me in Safari 5.1, but I can’t think of any genuine use for these. thx for the post!! very helpful! I drag an Emoji character to a Pages document, but only a blank “appears”. Working with Lion 10.7.2 and Pages ’09, ver. 4.1. I use the normal Mail Programm in my iMac. How can I use simples from emoji in the emailprogramm? No offense to the writer or whomever, but the use of EMOJI icons have been in use since OS X 10.4 You don’t need Lion for this. I love Emoji 2… Does it have that too? how do i get more characters with g-mail? Emojis of colour don’t appear properly.. 💁🏽 Is there any way to fix this? it seems odd and bothersome to me that emailing someone not on iOS would render the emojis within my text as unseeable except for a box. Why isn’t it transformed to an image rather than text when used? I was thrilled to hear I could use them, but knowing they won’t show to my recipients renders them useless. Guess I have to stick with the stupid old LOL.